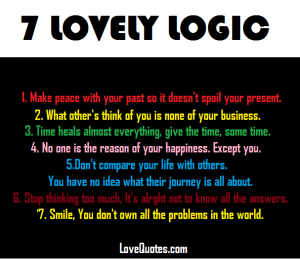 7 Lovely Logic 1. Make Peace with your Past so it doesn’t spoil your Present. 2. What others Think of you is None of your Business. 3. Time Heals Almost Everything, Give the Time Some Time. 4. No one is the Reason of your Happiness Except you yourself. 5. Don’t compare your Life with others, You have No Idea what their journey is all about. 6. Stop Thinking too much, Its Alright not to know all the Answers. 7. Smile, you don’t own All the Problems in the World.